This is the latest in the new wireless sonar fish finders and is extremely keenly priced compared to its rivals. 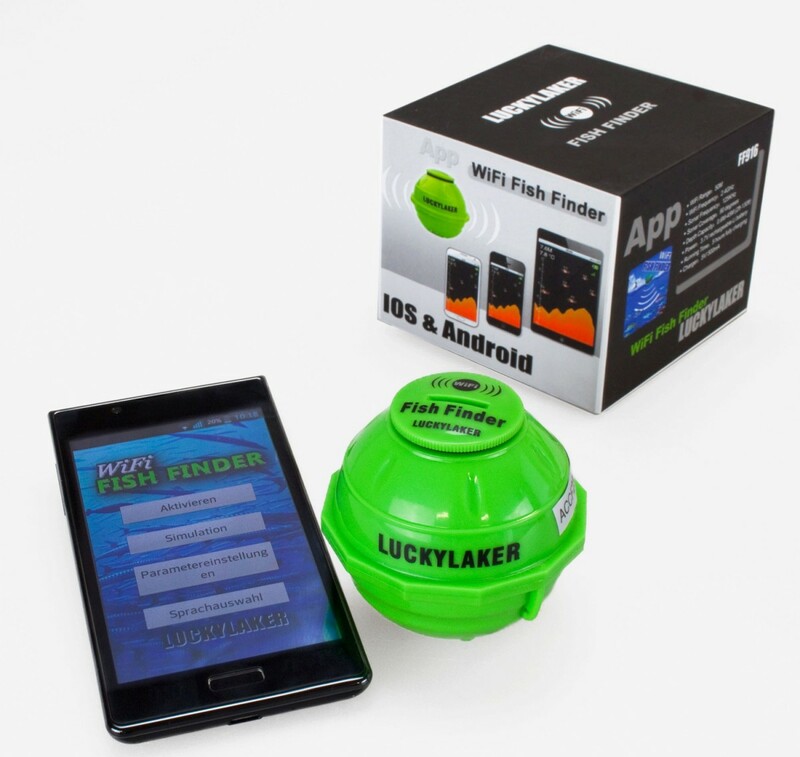 The Lucky Laker Wi-Fi Fish Finder is a unique IOS and Android compatible fish finder working with most Android and iPhone devices including smartphones, iPhones, iPads and tablets, using a free downloadable app. It is one of a brand new generation of wireless sonar fishfinders which are not reliant on phone networks and can report water temperature, depth and fish positions to up to 5 devices at once, through its own wifi network. 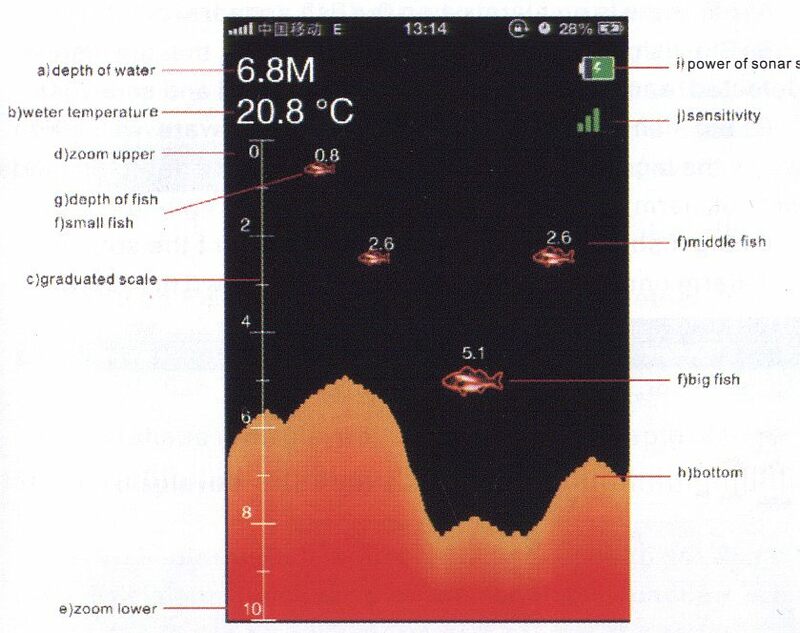 The FREE Lucky Laker downloadable app utilises the high quality display on modern smartphones and tablets to show clear images depicting water depth, temperature, battery status, signal strength, bottom contours and fish position. Can be attached to a boat or cast with a rod and line. Running Time: 5 hours from full charge. Users: Up to 5 per device at any one time. The Lucky Laker WiFi Fish Finder comes with clear instructions in English. The programming options include alternative language selection. Stillwaters: This device is ideal for fishing over large expanses of saltwater and freshwater lochs and reservoirs in depths up to 45 metres. It has a small attachment hole on its side through which can be threaded heavy duty monofilament or braid. Alternatively you can attach it using a strong snap swivel. It can either be cast into position using a fishing rod, or it can be attached to the boat. Slow retrieval will provide mapping of the contours of the lake bottom and identify any shoals of fish in the vicinity. We do not recommend attachment to a bait boat. It’s main usefulness to the stillwater / loch fly fisherman is the identification of shoals, or big individual fish, and their depth, which in turn suggests what the fish may be feeding on and what sort of fly or lure to use. Knowledge that there are fish in the vicinity also gives a big boost to your confidence and concentration when fishing is hard. When fishing a drift, the Lucky Laker is not going to tell you where to cast your fly, because you will have passed over the fish before you get the information, but it will show where the fish tend to be shoaling, and their depth, so that you can make a second drift over them. In sluggish rivers and stillwater fisheries, the Lucky Laker WiFi Fish Finder can be cast with rod and line to various positions to build up a map of the contours of the fishery bed, and the location of main shoals of fish. The device is also effective attached to kayaks and boats when fishing in depths up to 45 metres. The fishfinder can also be a very effective tool for fishery managers by mapping the depths and identifying favoured stations and depths where fish lie in different conditions, as well as identifying where specimen fish lie and providing accurate water temperature mapping. The Lucky Laker is straightforward to operate. There is a waterproof cap on the top which unscrews to reveal the charging port, on switch, and operation LED’s. You can charge it by plugging it into any USB power source using the USB cable included in the package. There is a LED light charging indicator. After pressing the power on button, it is necesssary to wait a few seconds before trying to connect to your phone or tablet. The free Lucky Laker Fish Finder App needs to be downloaded and installed on each device which will be used to receive from the fish finder. There are clear instructions how to activate the sonar unit. This needs to be done only the first time you connect each device to the unit. We rate this the best wifi fish finder in its class on the market. Looking to buy some Fly Fishing Accessories as part of a fishing gift? If you would like some advice on purchasing Fly Fishing Accessories, simply contact our expert fishing team, giving us either an email or phone number on which to contact you and we'll get back to you right away with the best advice and prices. FREE Delivery on all Turrall Fly Fishing Accessories over £100!! !